I want to continue my post from Tuesday about the importance and value of instrumentation. Today, I want to share SaaS metrics that can be answered with proper instrumentation (operational and business). Cost of acquisition. This is cost to capture an unaffiliated buyer. Need to know the costs associated with closing this opportunity including marketing costs, engineering support, etc. For this metric, it’s important to track the flow and behaviors of a customer through websites, sales touches, etc. D1, D7, D14, D30 retention metrics. Here, D stands for “day” and the number refers to the number of days since a user first enters the system. This metric tracks the percentage of returning users to the service in D days –gauge “stickiness”. Open and Click-Through Rates of Emails. Many products these days have email engagement and nurture campaigns. Here, companies measure if users are opening these emails and, if applicable, are they clicking into a destination the company is looking for. In-App Engagement.This is a big bucket including what pages, tabs, profiles, features are viewed and used. You want to understand how users interact with the product – are they finding pages useful? Are features cumbersome? Customer Lifetime Value. Same concept of the revenue of a customer (or net profit) but extrapolated against the number of times a customer buys (subscription, multiple products, etc.). Churn.That is, what percentage of customers stop buying annually? Good annual churn for SaaS businesses according to Sixteen Ventures is 5-7%. High churn may point to poor value, mismanaged expectations, or an inherent problem in the product. Average Revenue per Customer. To be explicit, it’s total revenue divided by customer. In this case, revenue would naturally be weighted by where most of revenue comes from. I get excited when a company properly instruments their products and services. It demonstrates tremendous maturity and understanding to recognize engagement data will drive confirmation (or rejection) of hypotheses, and thus, enables smarter business decisions. What are some other metrics you find useful? How would you measure success in your company? The lesson is to “instrument” an application to gather data points of how users interact with the product. Quickly, you can assess if users are traversing all the steps of a Getting Started Wizard, getting stuck while building out a team, or exiting a page with above-average frequency. We implemented Google Analytics at Body Boss which delivered anonymized data at an aggregate level – useful, but doesn’t give finer perspective into engagement. More powerful instrumentation would including capturing “events” to every actionable UI element (i.e. button), page, etc. For example, in Twitter, events would include when a user navigates to a user’s profile, scrolls down, Likes a tweet, and then searches for another user. Fullstory– records behind the scenes how users interact with a site or app that can be replayed later. You can see where a user hovers his mouse, scrolls, stays on some block of text, etc. Unbounce – taking A/B testing to multi-variate testing for landing pages. Quickly set up a landing page with multiple variants, and Unbounce automatically directs visitors and tracks conversions. MixPanel/ Intercom – Very different in how each operate, but the feature I liked most was being able to trigger specific messages (more granular than Pardot) based on user interactions. High-degree of control by building out event-driven rules and trigger notifications. Kevy – Marketing automation for ecommerce stores. Slick tool to understand consumer behavior and enables stores to better market to consumers by offering coupons, messages, and the like based on rules and triggers. In gist, there are lots of tools available for instrumentation with overlapping features. It’s fun learning about these tools now, and dreaming of how great these would have been at Body Boss. Though, several tools didn’t exist three years ago… inherent problems don’t change, but solutions do. What are your thoughts on instrumentation? What tools do you use? Time to reflect after two weeks of publishing Postmortem of a Failed Startup: Lessons for Success. It’s been a great journey, but it’s really just the beginning. Now comes the hardest part – promoting the book. Just like any startup, it’s about execution now. If you publish on Amazon’s Kindle platform, be careful when you say, “available on Kindle”. 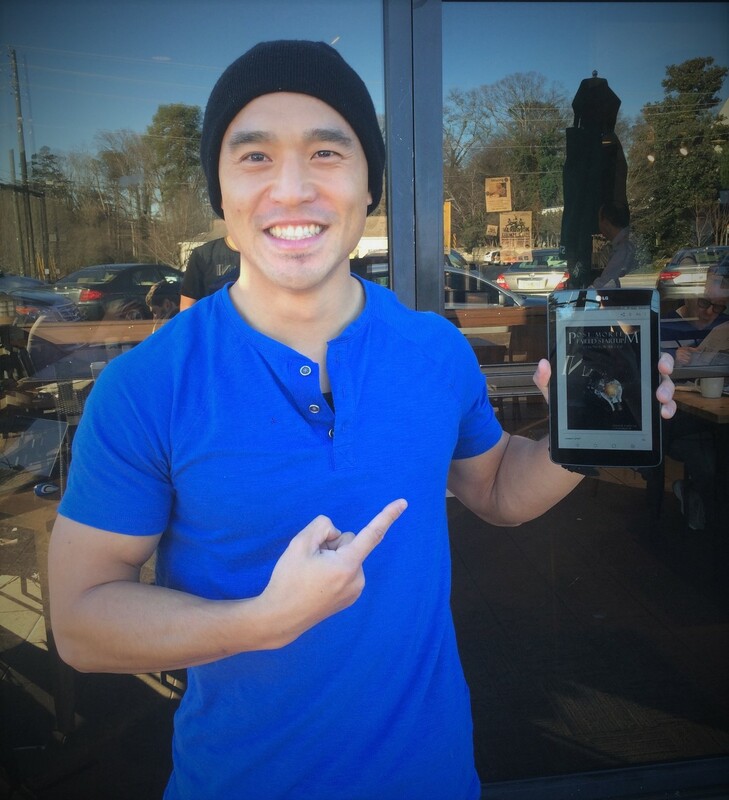 Most people don’t know Kindle is just the platform, and there’s a Kindle app available for any device – many think it’s just Kindle e-reader. Editors made my book way better. The first version of the book took < 10 days. It was full of content, but lacked cohesion and vision. The first round of edits immediately made the book 10X better. The more critical, the better. Three formal rounds of edits later (+ several personal ones)… book was in shape for publishing! It’s very easy to self-publish a book, and doesn’t cost much money. Friends as Editors = $0. Cover photo = $12. Cover self-editing = $0. Copyright registration = $55. International Standards Book Number (ISBN) 10-Pack = $295. Website template = $48. Website self-edit = $0. GoDaddy domain registration= $11.34. For everything else = priceless (err, “free”). Microsoft Word is great to write the book, track changes, and initially convert the book ready for mobile format. Beyond, know some HTML to make finer adjustments like formatting lists, pictures, etc. Everyone is impressed that I’ve written a book more so than I thought. I think it’s a goal or at least an achievement most people don’t ever think about. The moment I mention it, everyone is inspired and curious. It’s going to be great for branding. Writing the book wasn’t that hard. It was just sitting down and tackling it. I didn’t think about length or format at first. Instead, I made a rough outline of the topics, and made a goal to write two chapters a day. From there, it was easy to produce content. Then, editing made the book from stream of consciousness to coherent vision. There are many more thoughts, but these just came to me. I’ve been busy the last couple weeks, though, so I’m interested to see what happens in the next month when I reach a homeostasis and start promoting the book. What questions do you have about publishing a book? If you could write about anything, what would that be? Last Thursday, January 14th, I had the pleasure of speaking at the second Atlanta FuckUp Nights event. FuckUp Nightsis an organization in over 150 cities with events highlighting stories of failure. The format includes four speakers each with 10 slides that auto-progress 40 seconds each. The organizers expected 65 in the crowd, but we kicked off with over 100. Needless to say, the organizers, Tim Adkins and Jay Cranman, did a great job getting the word out. I had the honor of speaking among TJ Muehlman (Cofounder of Standard Code), Jerica Richardson (Cofounder of HackOut Ninja), and Kyle Azevedo (Cofounder of [former] ViaCycle). Rehearse, rehearse, rehearse. My friends in the acting world pushed me to rehearse… a lot. Happy they did as I didn’t struggle at all in the talk. Everything flowed real well and natural. Write a script, rehearse the script, but don’t follow the script. I wrote down word-for-word what I wanted to say. However, I didn’t once recite the script verbatim. I just let my mind speak with whatever it wanted to as long as the message was clear and the point was clear. Prepare for post-talk questions. There was 5 minutes following the talk for Q&A. I forgot to prepare for potential questions, and though, I knew my answers, I could’ve answered more succinctly. People really pulled in when I shared a vulnerable moment. Given I was talking about a very passionate, sore subject, I did get choked up at one point. My book’s collaborator, Don Pottinger, suggested this, and I’m glad I listened to him. The result was my story resonating really well with the audience. ALWAYS consider the audience. As speakers, our talks were our products. 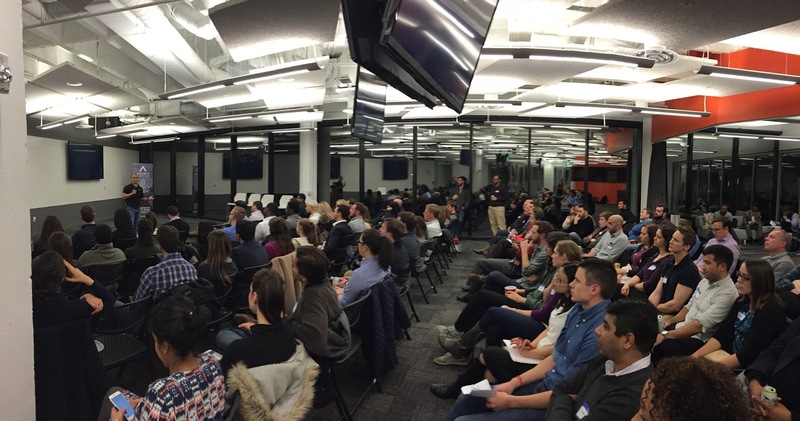 Our market was the audience made up of those in technology, startups, and those completely foreign to technology. This meant our messages needed to be adjusted to be easily understood by everyone (read: don’t get too technical). It was such a fun experience speaking, and I hope to do many more in the future. Stay tuned! What are some of your tips on public speaking? How have you prepared? I recently went to Disney World with my family like most every year. I am constantly in awe by what Disney attempts and achieves. A couple years ago, I was fascinated by Disney’s MagicBands. 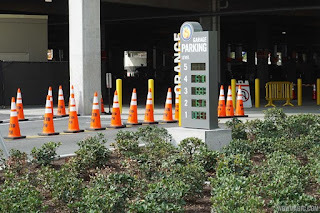 This year, I was fascinated by… their new parking deck at Disney Springs (formerly “Downtown Disney”)! 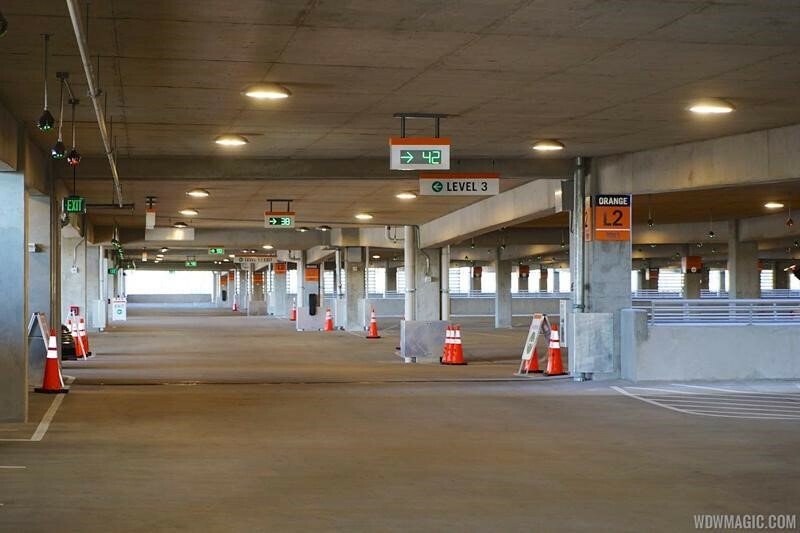 From the outside, the parking garage looks normal, if not massive with 3,000 spaces spread across 5 levels. When you enter, you see a sign with the number of spaces per level. This is pretty normal. I’ve seen this before and often questioned their accuracy. What does get interesting is when you pull into the deck and see counts of available spaces per row. Telling me how many spaces per row?! Now that just goes beyond what most parking areas do. 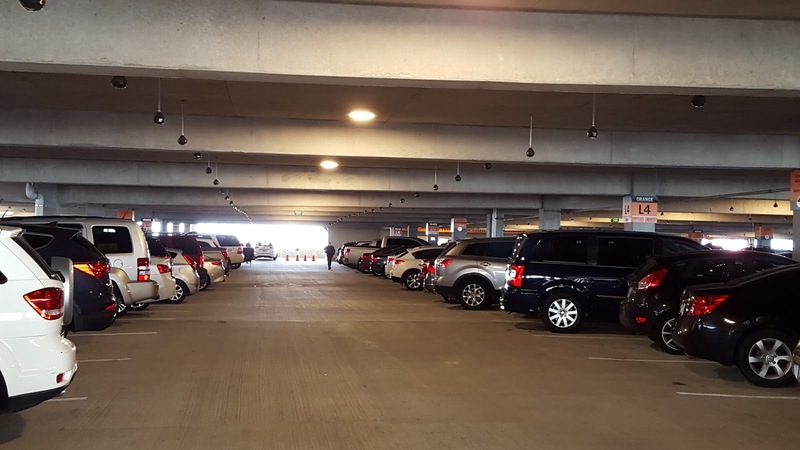 Atlanta Hartsfield-Jackson International Airport’s parking deck is big and complicated with one-ways and angled entries and exits. 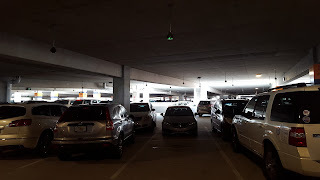 When I’m frantically searching for a parking spot because I’m running late for my flight, more detail with counts per lane would be amazing. 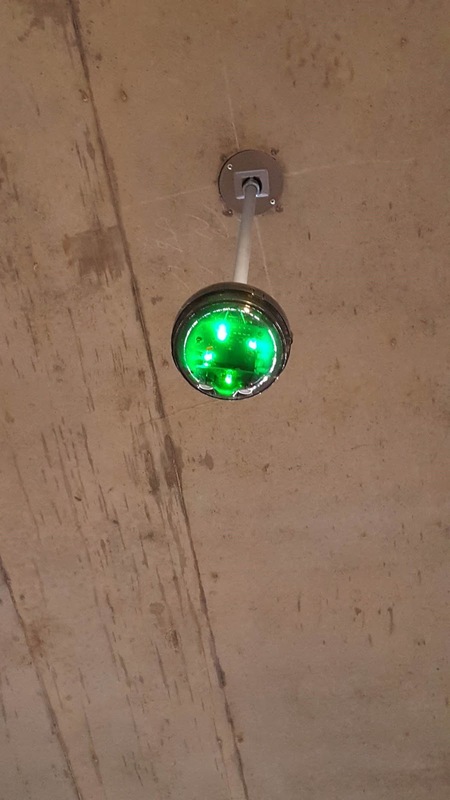 Further, the sensors are equipped with lights – red and green from what I saw, but unsure if there are other hues. These are fantastic as you look down each row to see wherethe available spots are. Wow, these are pretty cool. 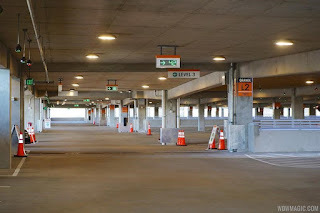 The parking deck is also FREE for everyone, which comes as a surprise (and very welcome relief) considering the high costs for every other attraction. Implementation of these sensors must come at a hefty price. Disney is, once again, banking on a consumer’s entire visit experience today and in the future to reap returns. The sensors also give Disney another stream of data. 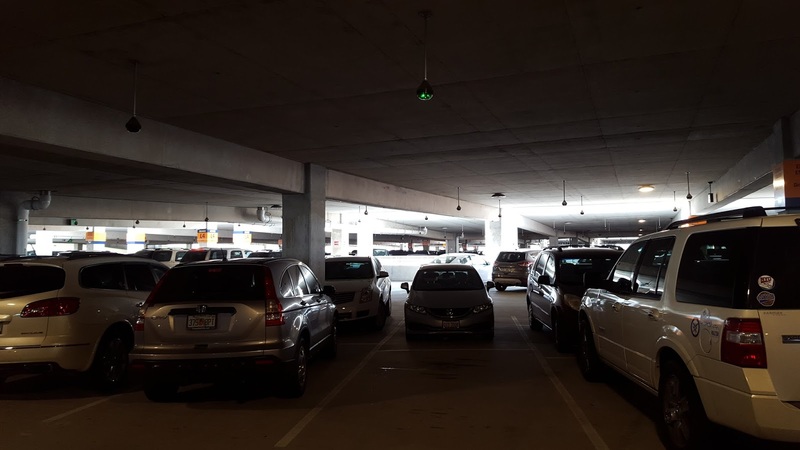 I’m unsure what is in each sensor, but the fact that they have them may allow Disney to do some traffic and parking pattern analysis. Perhaps they even have little cameras that they can also analyze types of cars, license plates, etc. to better understand where consumers are coming from. 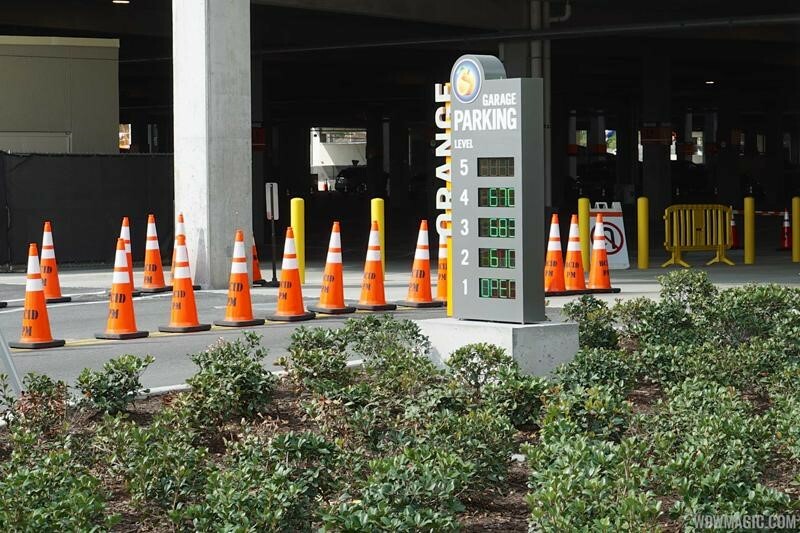 Further, Disney is consolidating parking options at Disney Springs into this deck and another one. Disney’s theme parks and resorts have pretty good ideas on volume of guests via tickets or room accommodations. However, Disney Springs is a large outdoor shopping and eating experience with no real “gate” or ticketing. Thus, I don’t think Disney has good visibility on visitors to the Springs. With the parking deck’s sensors, Disney can now have a data stream that can be used as a proxy for guest count. Moreover, it allows the company to direct consumer experience via its flow of people through specific entry and exit points. Disney is a massive corporation touching on everything from sports with ESPN to some of the finest resorts all over the globe (check out Disney’s Animal Kingdom Lodge) and incredibly expansive theme parks. Each resort, each theme park is a large business unit in itself with acute attention to detail. I can be surprised by how Disney is able to push such great technology (and adoption) amongst its vast corporation. However, I can also see the beauty and need to be aware by leveraging technology to constantly amaze visitor experience because of its size. So take a second and think about Disney and all that it touches… pretty magical, right? My Book on Startups and Entrepreneurship is PUBLISHED! Last week, I was excited to announce I was writing an ebook on startup and entrepreneurship. Today, I’m THRILLED to announce the book is PUBLISHED! I wanted to give the book away for free believing in the power of “free” for greater reach, but Amazon wants some money for their distribution. So, it’s actually $0.99. First, let me tell you about our Dream and my hopes for this book. Solve a real problem with a 10X better solution. Pick an industry where you have LOADS of experience. Have customer-PARTNERS at the beginning. Start Small and Targeted and KILL IT. Aside from quality, UI and UX are more than just table stakes. Be ready to pitch anytime and every time you walk outside. New customers are great, but existing customers are better. Market like a king with a blacksmith’s earnings. Dedication to the startup is a key for agility which is a key for success. Know thyself or get real comfortable finding out. I’m wicked excited about the book and perhaps with an equal part nervousness. It’s a highly vulnerable piece not just for its content but also because I’m not a writer by trade. I’m not paid for writing, so I can’t say my writing is good let alone great. However, there’s definitely good personality in the book, and good content informative for everyone and anyone. Okay, that’s it for now. Check out the book! Please let me know your thoughts on Twitter @TheDLuor via email at the.daryl.lu@gmail.com. Thanks, everyone! Hope you enjoy the book! http://www.daryllu.com/wp-content/uploads/2018/10/entrepreneurial-ninja_logo_sm.png 0 0 Daryl Lu http://www.daryllu.com/wp-content/uploads/2018/10/entrepreneurial-ninja_logo_sm.png Daryl Lu2016-01-05 15:51:002016-01-05 15:51:00My Book on Startups and Entrepreneurship is PUBLISHED!